Hi there! It’s Hannah. 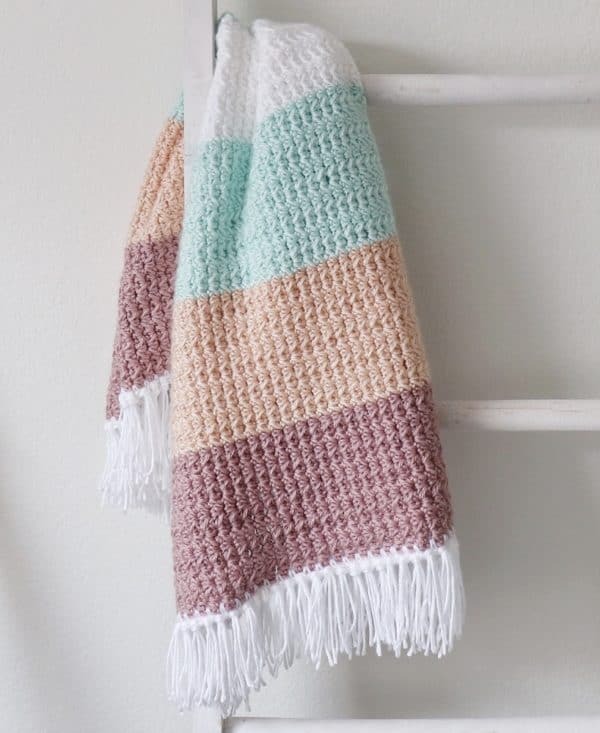 I’m excited to share this pattern for the Crochet Boho Color Block Blanket because I’ve had the colors for this project sitting in a basket for a long time and I’m glad I was finally able to put them together. I wanted to try out a new stitch for this blanket and I chose the Modified Daisy Stitch that my mom used a while ago for her Modern Nautical Baby Blanket. It did take me a couple tries with a practice swatch to get the stitch down, but once I figured it out it was really easy to see where to insert my hook every time and I love the texture it created. I also love that it makes such straight lines when you change colors! I made this blanket for a friend who is expecting a baby girl in the next few months and I hope she’ll like it. I even found a really beautiful book to go with it called The Dreamer by Il Sung Na and I can’t wait to send them both to her! It’s a darling book about a pig who really wants to fly and how he works really hard to achieve his dream :). I will explain how to work the Modified Daisy Stitch in the pattern below, but if you’d like to see a demonstration of how to work the stitch, you can watch the video below or click here to watch on YouTube. ROW 1: Yarn over (YO) and pull up a loop in the second chain from the hook, YO and pull up a loop in the third chain from the hook. Skip over the next (fourth) chain, then YO and insert your hook into the next (fifth) chain and pull up a loop. YO and pull through all seven loops on your hook. CH 1. ROW 2: YO and work into the second chain from the hook and pull up a loop, insert your hook into the third chain from the hook and pull up a loop, skip the next stitch, YO and pull up a loop in the next space. YO and pull through all seven loops. CH 1. *YO and insert your hook into the chain space and pull up a loop, YO and insert your hook into the next space and pull up a loop, skip over one stitch, YO and insert your hook into the next space and pull up a loop. YO and pull through all loops on your hook. Repeat from * to the end of the row, CH 3 and turn. Repeat row 2 for the rest of the blanket. 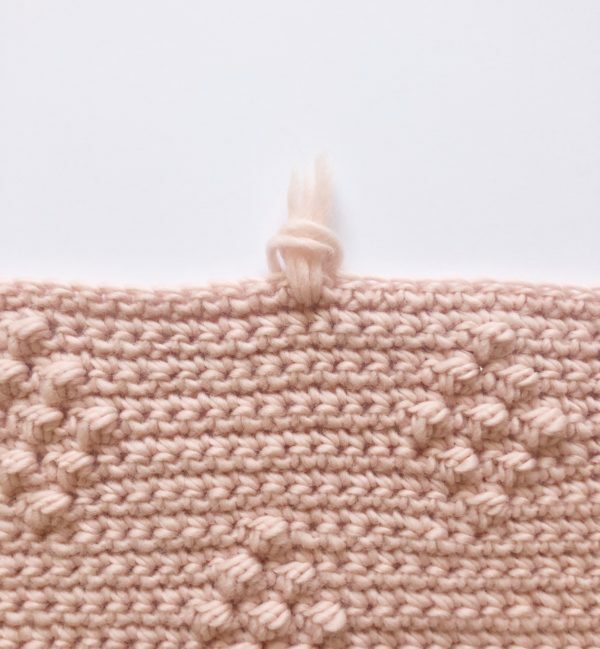 When changing colors, you’ll want to pull through with the new color on the last stitch of the row when you have seven loops on your hook. Then you’ll chain 3 with the new color and turn. When I finished the blanket, I decided to add a simple thin white border before adding the tassels. To add the border, pull up a loop in any corner and chain one, then work a SC plus CH 1 in ever other stitch (or between the posts on the sides) around the whole blanket, working 3 SCs into the corners. When you reach the corner you started with, work 1 round of SC in every other stitch, again working 3 SCs into the corners. When you get back to where you started, slip stitch into the corner and tie off. Before I added the tassels, I blocked the blanket by laying it out flat, getting it wet with a spray bottle and pinning the corners to help get the sides straight. For the tassels, I used the same simple method that I used in my Diamond Berry Stitch Blanket. Wrap a piece of yarn around the notebook horizontally. Then cut the yarn in half. Take three to four pieces of yarn (depending on how thick you want your tassels; for this blanket I used three) and fold them in half. Insert the folded end into the chain space above the last row. You can use your fingers or a large crochet hook to do this. And pull tight to make a knot. And that’s it! You can space your tassels out however far apart you’d like and you can also make the tassels longer by using a bigger notebook, or trim them down if you want them to be shorter. 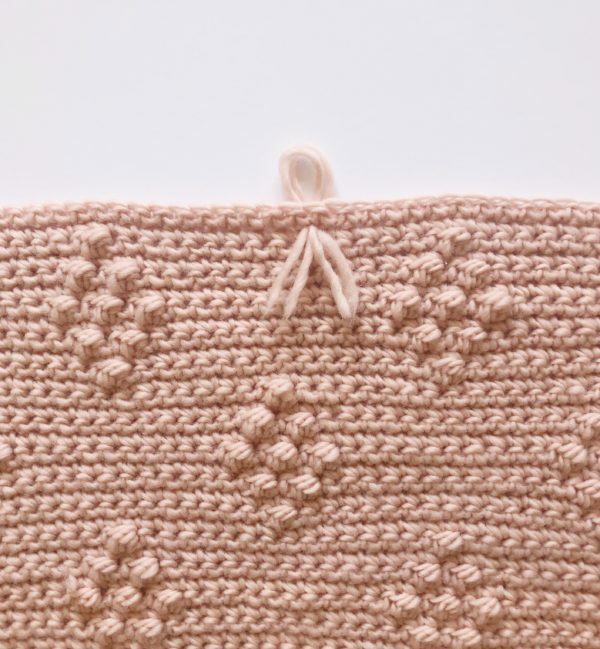 Thank you so much for coming to see this pattern; I hope you enjoy making this baby blanket! If this is your first time visiting our blog, you can click here to learn more about my mom and I and why we like to crochet 🙂. When you finish your project please come share a picture with us on Facebook or Instagram using #daisyfarmcrafts, we’d love to see and share your work!